Stan-Max in the original, it is the benchmark for quality in professional bodybuilding among performing athletes and world-class professionals, as evidenced by reviews in many countries. Due to the minimal androgenic effects on the body and of course not being able to retain water in the muscles, the Stan-Max course is ideal for drying all muscle groups and preparing both for the beach season and for performances in competitions. Therefore, we can safely say that the drug Stanozolol inj. It will serve well for giving tough relief, hardness and stunning appearance to your muscles, and drawing of veins and reducing subcutaneous fat will make you much more noticeable in the ranks of ordinary gymnasts. The active ingredient in Stanozolol injections is not dissolved in oil, like all regular anabolic steroids, but in a solution for injections, which gives instant absorption after the use of an anabolic injectable. Due to the fact that the active substance stanozolol is rapidly absorbed into the blood and has a short period of action, injections of the drug must be carried out a maximum every other day to maintain the required amount of the active substance in the body. 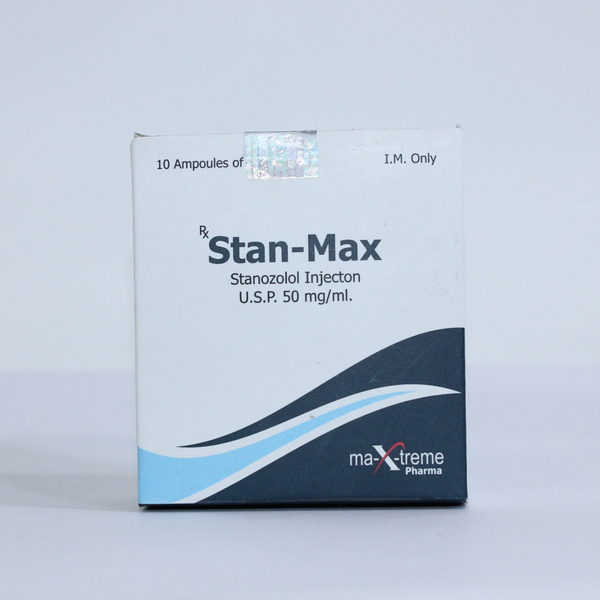 The course of Stan-Max should last 6 to 8 weeks, and the dosage of the drug should be 50mg for injections every day and 100mg each if injections are performed every other day. When the course is used for drying, it is necessary for the full result to follow a protein diet and do cardio exercises. By making a correct course adhering to the basic rules and recommendations, side effects are reduced to zero, and this helps not only to protect your health, but also significantly save money, without making expensive items. Of course, you can use stanozolol solo, however, the combination of drugs will give a much better result, both during the drying period and for a set of high-quality muscle mass at any time of the year.